As the military opens more roles to female servicemembers, the experience of those who first carved a path to leadership will be critical to the development of future leaders. 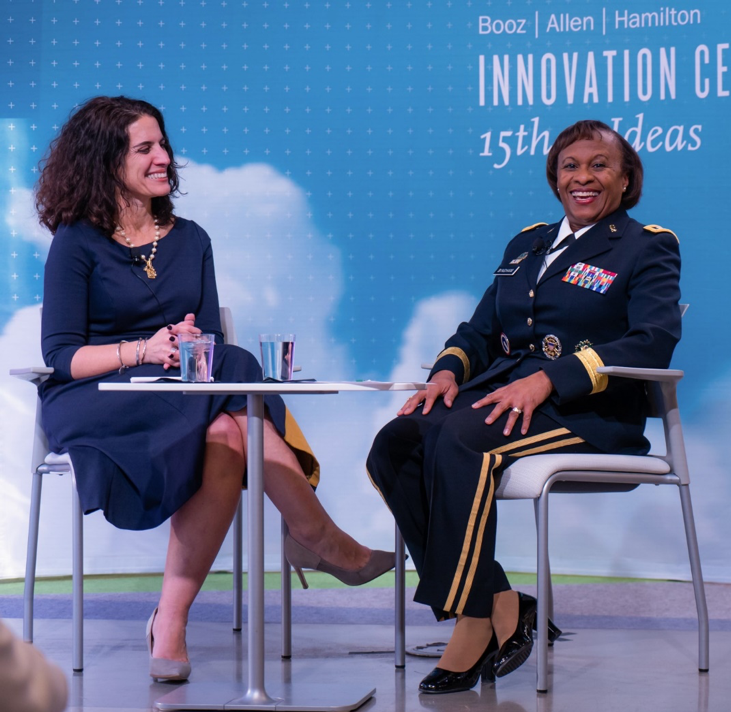 That’s why Booz Allen Hamilton welcomed U.S. Army Lieutenant General Gwendolyn Bingham to its Innovation Center on March 11th. LTG Bingham shared her personal journey to become the first female in a series of critical roles in the Army – including the first female Quartermaster General, first female Commandant of the Quartermaster Center and school, first female commander of the United States Army TACOM Life Cycle Management Command (TACOM LCMC) and of the White Sands Missile Range, and of course the first female in her current role as Assistant Chief of Staff of the Army for Installation Management. LTG Bingham discussed her journey to this historic career from her days in the University of Alabama ROTC. When she started, LTG Bingham intended to stay in the Army for a total of 4 years. Instead, she went on to build a career based on her love of the men and women who served with her. LTG Bingham cited her strong marriage, faith and committed mentors along her journey as the keys to her success. She noted the support of her husband, who previously served in the military, in helping her balance her obligations to the Army with her home and family life. LTG Bingham emphasized the importance of lifting others up along the way as both a means of giving back and for creating effective teams. LTG Bingham shared her “Bingham’s Top 10 plus 4” rules for effective leadership, which are centered around teamwork, respect and rising to the challenge of tough or even unwanted jobs. The event was a part of Booz Allen’s Women’s History Month and was co-sponsored by the Women’s Forum, African American Forum and Armed Services Forum.